It’s not all doom and gloom out there – Ford cars sales are rocketing! The Blue Oval says its sales figures for April have increased on a year ago – and increased its market share. Ford is the UK’s market leader and puts its success down to the introduction of new high-technology features and models. The firm points to its new 1.0-litre EcoBoost engine in the Focus as one example. The car’s outstanding fuel efficiency and strong performance and accounts for 17 per cent of Focus sales in April, the first full month on sale. The Society of Motor Manufacturers and Traders (SMMT) says Ford cars sales last month were 20,535, up 11.5 per cent, compared with April 2011, while the market as a whole was up 3.3 per cent to 142,322 units. 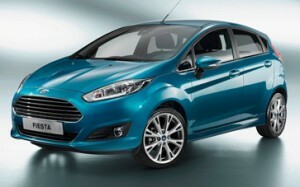 The best selling car in the UK for April was the Ford Fiesta. It took 6.2 per cent of the total car market with 8,780 sales, up from 4.9 per cent and 6,755 sales in April 2011. Ford Fiesta is also the UK best seller for the year to date; its sales have increased from 34,679 to 42,170, compared with the same period in 2011. In one sense it’s hard not to feel underwhelmed with the Fiesta but it does what buyers want – and Ford cars‘ build quality is vastly improved on what they were churning out a few years ago. Other models doing well for Ford cars are the Focus, Mondeo and Galaxy. Which company leads new vehicle sales in the UK? This entry was posted in Car Leasing, Car Updates & Releases, New Cars, News and Views and tagged best selling car, caption, car, ford, Ford cars, Ford Fiesta, Ford sales, fuel efficiency, LS, MoT, Society of Motor Manufacturers and Traders, technology, UK by Steve Lumley. Bookmark the permalink.